The Crow and the Powderpuff | A Creative Makeup & Beauty Blog: Glamour Dolll Eyes 1 Day Last Sale of the Year! 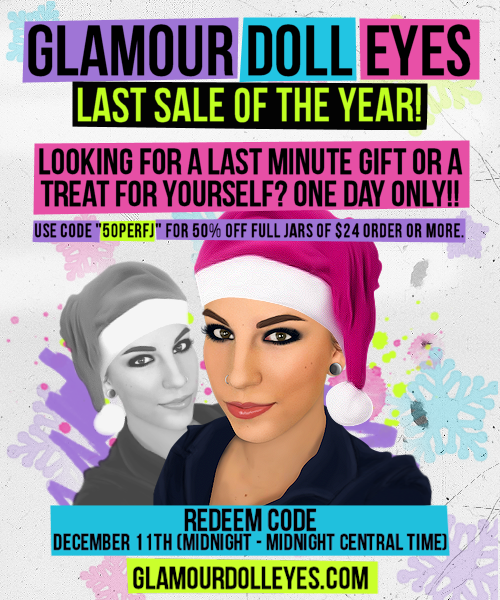 Tomorrow (12/11/2012) Glamour Doll Eyes is having their last sale of the year, so go check them out! 50% off Full Jars on orders of $24 or more! Sale only goes December 11th 2012 Midnight - Midnight Central Time.